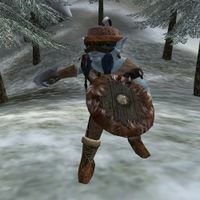 Creatures on Solstheim are highly adapted to the bitter conditions; many of them are immune to cold. 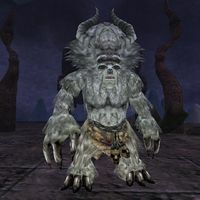 They are generally stronger than the wildlife in Morrowind, higher in level and have more sophisticated abilities and tactics. See also undead for the more unnatural creatures encountered on the island. 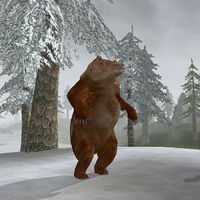 Description: This dark red furred bear is the weakest to be found on Solstheim, but is nevertheless an impressive creature, much larger than the average adventurer, especially when standing up on its rear feet. Found: All over Solstheim in the woods as well as in some ice caves. 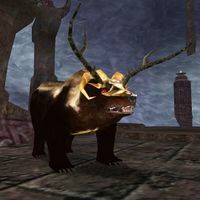 Description: Of similar size to the grizzly bear, this beast is more resistant against the surrounding nature than its cousin, and known to carry diseases. "They're big, and deadly! Their claws and teeth can freeze the flesh of an enemy." — A drunkard at the mead-hall in Thirsk. 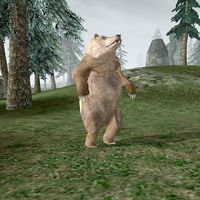 Description: This magnificent beast can only be found in a few locations on Solstheim. It is perfectly adapted to its cold habitat and must be feared for its brutal attacks. Description: A strange huge creature that lives underground. Little is known about it. Found: Occasionally found in some ice caves. * This ability is turned off if the Grahl is receiving Fire Damage. 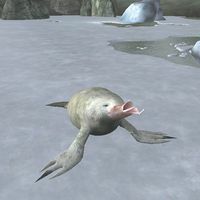 Description: A peaceful sea animal that is typical for the seaside of Solstheim. However, if not left alone it is said to chase an aggressor even on land. Found: Common at the northern seaside, in the rivers and the lakes. 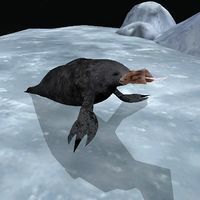 Description: These little creatures reside in the coldest region of Solstheim and are often met in packs of five or more. While one is easy to fend off, a group can be a deadly threat. 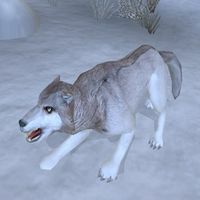 Found: Common in the colder northern and northwestern region of Solstheim. 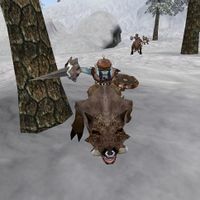 ** While the Riekling Raider may appear to be two creatures, a Riekling mounted on a Tusked Bristleback, they are for all practical purposes one creature. The rider can never be separated from his mount, even in death. 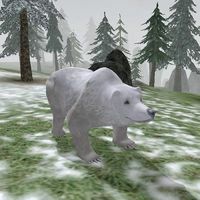 Description: These spirits of the icy forest are like the local trees. Strong and resistant. Protecting the woods against intruders they fight anyone coming near and are feared greatly because they cannot be killed easily. Found: Common in the greener southern region of Solstheim. Spriggans will self-resurrect completely the first two times you kill them. Each time, they come back bigger, and with more resistance. As a result, you can harvest three souls from them if you Soultrap them each time. This makes them the most convenient source for high-end soul gem filling for long-lasting weapon enchantments, especially if one is saving maximum-value souls (Golden Saints, Ascended Sleepers) for Constant Effect enchantments. If you kill a spriggan once and immediately loot its body you can dispose of its corpse and it won't resurrect again, but it won't count as being killed (so don't do it during a quest where you have to kill spriggans). It does not appear possible to loot a spriggan corpse between its second and third lives, as it starts to self-resurrect without any delay. 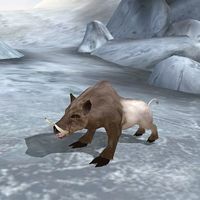 Description: The wild boar can be found in the coldest regions of Solstheim. Aggressive and mean, resistant against most influences and a fierce fighter too. Often comes in packs and should be avoided. 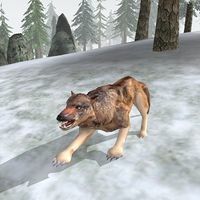 Description: Next to the plague wolf the most common animal on Solstheim and they often travel in packs. Found: Common all over Solstheim apart from the coldest northern region. Description: This natural hunter likes to attack in packs, surrounding the prey. These creatures can spread diseases and should be treated carefully. 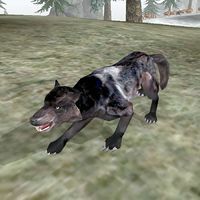 * It's likely the plague wolf was given this spell by mistake instead of the Resist Paralysis ability, since the wolf does not have enough magicka for this or even the ability to cast spells. Description: This rare creature is the toughest of its kind and often sought after because of its fur. The narrow passage through the Moesring Mountains that leads from the Harstrad River toward Hrothmund's Barrow, located in the northwestern corner of the island. Near Captain Roberto Jodoin amid the wreckage of the Dwemer Airship, in the Isinfier Plains. Just a little southwest of the airship. Southwest of the Water Stone. 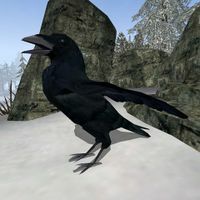 Description: This strangely large raven appears at a certain time on Solstheim. Found: At the Altar of Thrond. Ettiene is normally found as an Imperial woman. 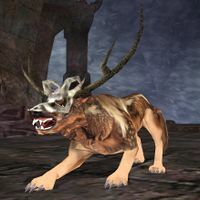 Description: These creatures represent the Daedric Prince Hircine during his hunt on the mortal plane. 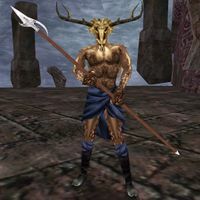 *These two versions of Hircine are seen only during cutscenes, and cannot be attacked. 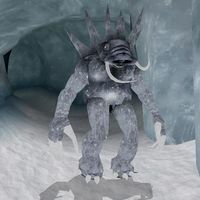 Description: This frost giant is probably the largest creature on Solstheim, and unfortunately on the same mission as yourself. *This ability is turned off if Karstaag is receiving Fire Damage. 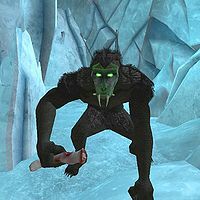 Description: A dreadful monster that dwells in an ice cave and has a taste for human flesh. Found: Lair of the Udyrfrykte. 5−50 pts melee plus "weapon"
These new creatures use models found without the expansion, but with different IDs. This page was last modified on 5 March 2019, at 10:04.